Yesterday I posted a translated article about the comparative demographics of ethnic Danes and culture-enrichers in Denmark. Based on the graph above, I projected a majority of culture-enrichers in Denmark by the year 2103. However, there was a problem with my calculations: my assumption that the number of immigrants and their descendants in Denmark was 250,000, or about 5% of the population. An alert commenter named T Ross pointed out that the immigrant population mentioned in the article — which I somehow neglected to notice — was actually 499,903. Although that number is almost twice as much as my assumption, it doesn’t mean that the culture-enrichers will pull ahead earlier than 2103. The higher number means the annual rate of increase is slightly more than half of what I used: 1.79%. I reran the software and produced the new table of figures below. The rest of my assumptions remain the same — see yesterday’s post for the details. This entry was posted in Counterjihad, Enrichment, Europe, Immigration, News, Scandinavia by Baron Bodissey. Bookmark the permalink. Baron, your data prediction looks like a bacteria culture prediction in a bottle. Denmark is open system, not closed. Did you take in consideration that more islamized the neighboring country become, more islamic influx will happen to Denmark ? EU and UN are accelerating the import of muslims…did you take in consideration also this ? More islamized Denmark become during the time, bigger the demographic gap become. More danish women will actually become muslim producers. Then, when life will get worst during the time, danes will have les and less children, while muslims will have more and more (they must conquer the world). Then…when life in Denmark will become real danger for whites, many will run in other countries where life as a white is secured. When muslim population reach 15% – 20%, the rate of rapes and killings against whites increases.. Socially, this will be a major factor in whites births. Sorry for pointing all this…but…if political tendency and the rate of islamization continue as today, there will be not so many years back. “when you hear gunshots on the street, there is no more erection. And there will be no more children”. Sorry, but the numbers are still not sufficiently clarified. According to your figure, about 577 x 4, say about 2’300 “new Danes” were added. The new additions of Danes in third quarter 2018 likely includes citizens returning from prolonged stays abroad. Let’s ignore that point for this calculation. Perhaps a Danish versant reader can investigate the number of newborn Danes in 2018, versus newborn Non-Westerners in 2018. 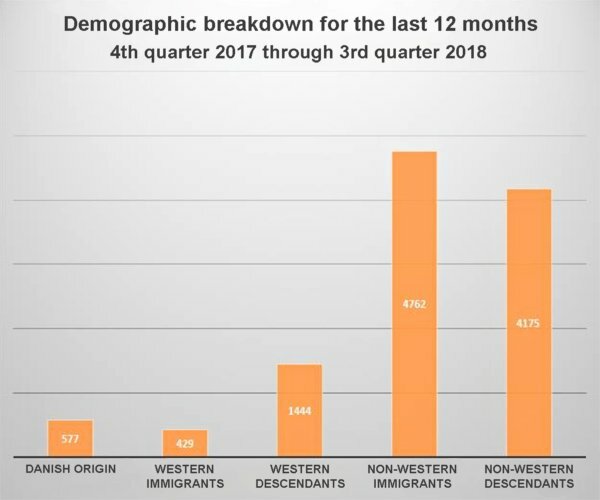 There will be very few babies among the immigrants migrating during the third quarter. Few but some. Most immigrants are angry young men, aged 17 – 25. But we need the actual newborns Non Westerners in Denmark during 2018. But the 500’000 immigrants residing in Denmark produce newborns. That number is interesting. The figures for newborns in 4 quarters in all of 2018 will give you the composition of the first grade class in 6 years in 2024. Is it already 50% allochtone? Or only 10% indigenous? This will help answer the following questions. What will the new recruits to the police force and to the security services in Denmark look like in 18 years? Who will join the Denmark NATO forces in the year of 2036. Will it be 30%/40%/50% Muslim? Who will perform the research at Universities in 20 years? and in 30 years? I have a weather app on my phone which is only about 50% accurate on predicting whether there will be rain in 3 days. As you point out, demographic shifts are very complex. I think the point of the exercise is to show that given anywhere near the present trends, by any measure whatsoever, Muslims will control Denmark in 130 years at the outside. But, if Denmark retains a representative government, and Muslims act in their usual identity-politics mode, Muslims will control Denmark far before that date. Islam needs only about 20% to conquer and rule a state. So, look to 2057 before you are serving your Arab masters. Yes, the other factor is as the muslim population rises ethnic Danes will get out of the country for their safety and family’s future. So these emigrants will speed the take over by the immigrants. It’s already happening with French and Swedes moving to Hungary and other countries. It won’t take a majority of CEs to end Denmark. The CEs will just keep making demands until they effectively own the country. When you look at how much trouble they already cause as a minority today, one can easily imagine, how things will develop when they will be a larger minority. Or even have the same size as the native population-s in European countries. So things will get worse quiet fast, long before they become the majority in any given country. Of course they already are a majority in some areas and communities. Just like a Migration-Jihad mastermind like Prof. Ali Kettani proposed in his works. Interesting. I’ve been planning to try a simulation in a spare moment (of which there admittedly haven’t been too many, lately). Does your algorithm account for things like average age of childbirth, type of migrant (by religion/cultural background), or intermarriage? Also do you use any integration method (eg trapezoid, Simpson’s, Runge-Kutta), or is it a sum from one year to the next? Green, you can’t really use normal algorithms when you take in consideration this type of scenario. I give as example the muslims in Romania…Many muslims were prisoners from Ottoman times…I mean, the muslim minority in Romania is a very small minority….So…during the past 100 years they didn’t evolved as number more than the rest of the population. They also didn’t have the right conditions to try forcing their will against the rest of the population. Actually, I do know few non-muslims getting married with muslim women and their children are christians…so…It is also important the level of acceptance of the rest of the population to their claims and aggression. More effeminate nations have zero chances…while nations decided to defend are not at risk. Yes, it’s more complex… also the higher % of migrants = more chance of left-liberals getting into power = open borders = vastly faster increase?! No, I just used a straightforward exponential increase model — each population (Danes, culture-enrichers) was assumed to grow by the same percentage each year (Danes: 0.011%, CR: 1.79%). Obviously, this model is useless for making real predictions, but that’s not its purpose. It simply shows what would happen if things continued as they are. Not only is the actual situation far more complex, but it is also affected by the collective decisions of the populations involved. At some point both Danes and migrants may well decide to change their behavior, and then all the parameters change, too. Ah, I see. That would explain why higher starting number of Enrichers = lower growth rate = Danes staying a majority for longer. Your model is a best case model in that case. The Danish population will start to shrink at some point given current birthrates. The white population of America has recently started to do this. The numbers aren’t obvious yet (less than 50,000) as the aging population hides the reality but there are several million less white children today than in the USA a couple of decades ago. The same will be happening in Europe. Less children means less child bearing women of the next generation. Add mixed marriages into that as the immigrant groups appear more successful, at least to people from poorer backgrounds, and the number of native Europeans will decline at faster rates. At this point if the native birthrate isn’t increased then it doesn’t matter what happens with borders. Close them all now and the native European population will still decline and become a minority, at least the western half. Western culture has been replaced by something else and is dying out as a result. Demographic predictions can’t be made that far out. For one thing, they’ll be flooded by (relatively) culturally-similar Swedes before then. If they make sure to only take the right-wing ones (and let the left-wing ones rot in the hell that they created), it could turn things around for them. If they also take the left-wing ones, it could accelerate it. Yes, right! Statistic predictions far out can prove wrong. Nice anecdote illustrating: according to present growth of horse carriage traffic in Zürich around 1880, the city would nowadays be covered under 20 feet of horse manure, not bovine. Then came the machines. And the machines drove out the horses. There went whole piles of good soil amendments…one of my great-grandfathers used to pay his children to go out into the street and gather what he called “rose food”. He was famous for his roses. And his cabbages, for that matter. we still did that in fifties by wagonload( to pay for) to fertilize the vegetable plots. The forecasting cannot allow for all variables, but certainly by the time the CE population grows from its current 10% to 20% (overwhelmingly urban) around in the 2050’s there will be (and have been) a greater outmigration of two groups of Danes: young, tertiary-educated people who have the skills that allow them to immigrate to the New World or Eastern Europe (and who would be producing a good proportion of future Danish babies); and retirees who are in a position to cash up and move to rural Denmark or to Eastern Europe. The proportion of CEs in urban Denmark will accelerate, creating a downward spiral in urban living conditions. Mike, above, postulates that there will be an non-CE emigration to Denmark from Sweden. It is likely that there would be some by people of limited means seeking a similar culture, but those Swedes uprooting their lives are more likely to relocate much further away than Denmark if they can afford it and are accepted by safer Western countries. I reread “The Danish Civil War” (posted at GoV in 2007) again last night. For the fourth or fifth time. The author really should turn it into a novel the premises are so compelling. What a pity it wasn’t published as a booklet and distributed free throughout Denmark eleven years ago; maybe, just maybe, matters may be slightly different now. The Danes unwillingness to reproduce seems to be a huge problem. Prof Nyborg has already done the math.He projected a majority of culture-enrichers in Denmark by the year 2085.